Do you live driving distance from Holmdel, New Jersey and got no plans for this Sunday? 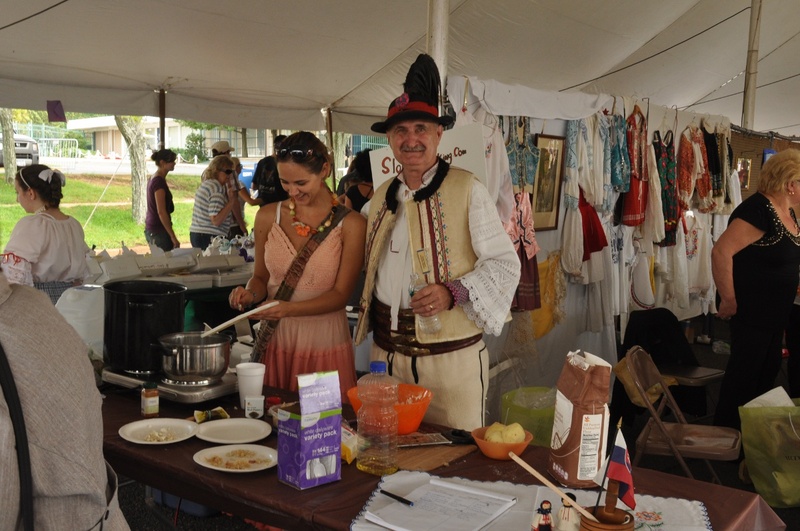 Then make sure to come to the 34th Slovak Heritage Festival. This is the largest Slovak festival in the country and is attended by thousands of people. The president of Slovakia also makes a regular attendance (no idea if he will be attending this year). 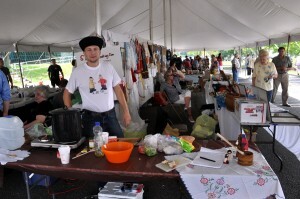 And best of all, this year’s festival will include a hands-on cooking demonstration by me, Lubos from slovakcooking.com. So make sure to come. The festival will begin at 10:00A.M. with a full program of events. Bishop Peter Rusnak of Bratislava will celebrate the Byzantine Catholic Mass in Slovak at 11:00A.M. The cultural program begins at 2:ooP.M. with a a Parade of Fashions. The featured dance group is PAS from Pittsburgh, along with three children’s groups. There will also be a soccer tournament throughout the day. a lot of delicious Slovak food and baked goods. Entrance and parking are free, with plenty of room for buses. For more information, please call Steve Zluky at 908-534-2710. Here are few photos from the festival. I ended up doing 3 sessions, the first one was goulash, the second one was halusky, and the third one was working with leavened dough. Goulash cooking: add meet, onions, spices a je to! 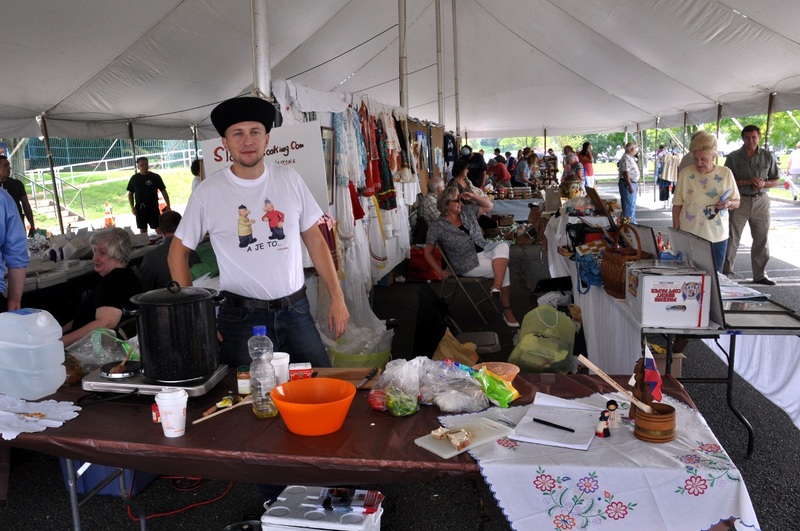 Second picture has Steve Zluky, he is the main organizer of this NJ Slovak Heritage Festival. This is from the halušky making session. 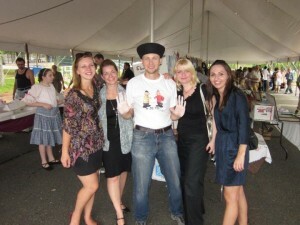 And here is a picture with Michaela Loren who runs a social group for Czechs and Slovaks living near New Jersey. This was after the final dough making session so my hands are covered in flour. You all have a good time!!! Can’t make it this year, going to be in PA. Hope you come again next year so we can meet you. I love Slovak festivals. When I lived in NJ I made sure I attend it every year. 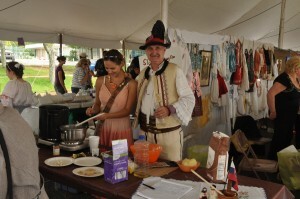 The festive atmosphere, Slovak arts, kitchen, special visitors, etc. made it my special holliday. This year I will travel up from Florida. i live three miles away.I will definitley attend. when is the next Slovak Festival in NJ???? cant wait to go this year and bring my kids. I missed your cooking sessions but I did get to enjoy a delicious lunch on a beautiful day. Festival was pretty cool and since I only live a half hour away I will continue to go. It was nice to hear all that Slovakian being spoken! POCAS 22 ROKOV JE TO MOJ NAJVECSI SVIATOK V USA NEVYNECHAM ANI TENTO TESIM SA.